A classic from the 1950's! this Rucksack is unchanged for almost 65 years and there's a very good reason for that, its a great backpack...so why change it? 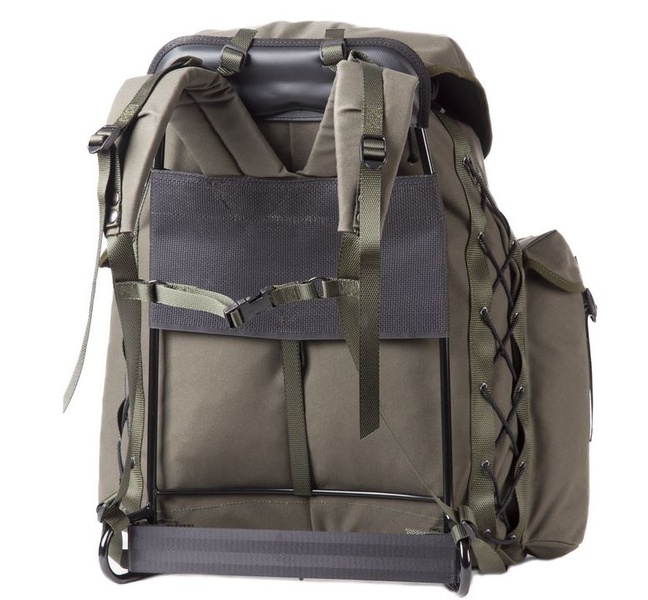 It has large central envelope for all the bulkier gear, with two side pockets (easy access to waterbottles, cook kits etc) and a back pocket for essentials. Combine that with a great steel frame, simple, but solid material construction, ease of entry and adjustability and it has everything you need to make it work. Take it in the Woods! The spacious, easily packed bag and the carrying comfort of a modern external frame backpack make the 339 a fine choice for longer trips as well. A classic model from the 1950s, only the materials have been updated over the years but the design has remained the same. The main compartment of the bag (dimensions approximately 50 x 40 x 20–30 cm) is closed by tightening the drawstring opening which is covered with a flap that can be secured with straps. The straps are long enough to attach, for example, a rolled sleeping mat or blanket under the flap. If necessary, additional detachable straps can be used to lengthen the straps. The contents of the bag can also be accessed quickly through the small side zipper on the right side of the opening. As a special feature, there are strings on the sides of the bag that can be used to tighten it to make the bag sturdy with less stuff inside, the range of adjustment is approximately 10 cm. Conveniently, you can pack extra supplies behind the side strings. The side pockets (dimensions approximately 33 x 10 x 6 cm) are closed with fitted flaps with good coverage and secured with leather straps. The side pockets are ideal for packing large Thermos flasks and other cumbersome, long supplies. The back pocket (dimensions approximately 20 x 30 x 6 cm) is closed with a flap equipped with two leather straps. You can pack plenty of small supplies into the generously sized outer pocket for quick and easy Access. The frame of the carrying device is the steel pipe frame of the 339. The lower part of the frame is bent, forming a base onto which the backpack can be set down safely even on sharp stony ground. The supportive carrying system similar to external frame backpacks assures carrying comfort. The back length is continuously adjustable to suit users of different heights. Your upper back sits against stretched netted fabric and your lower back, in turn, against a strap saddle: these keep the bag itself from touching your back for the most part, making for less sweaty conditions. The shoulder straps are wider than normal and padded, a chest strap with a buckle gives additional support. The supporting point of the shoulder straps is located at the top of the frame. It is possible to adjust the centre of gravity of the backpack even while walking by tightening and loosening the adjustment straps of the shoulder straps. 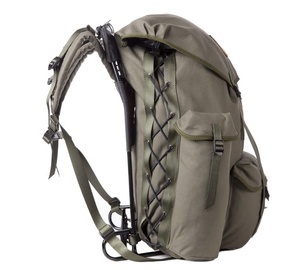 The operating principle is roughly the same as with the supportive carrying systems of external frame backpacks. External dimensions: height 50 cm, width 45 cm, depth 25–35 cm. Materials: paraffin-treated cotton, polyamide strap. Colour: olive green with black buckles. The product has a 5-year guarantee against material and manufacturing defects. 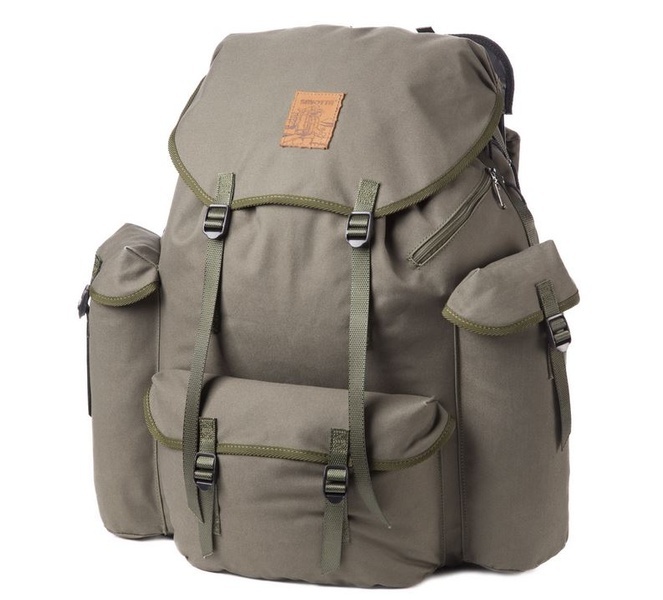 Purchase through PayPal by using the "Add To Cart" button above or use the form below to order the Savotta Classic 1950 Rucksack . Feel free to contact us if you have any questions about the Savotta Classic 1950 Rucksack .